Located in eastern Al Kharid, the duel arena is a way to earn money, a way to lose money and a way to pass the time for the majority of players in Runescape. Two players agree on the terms, put up their bets and enter an arena where only one of them will leave alive, taking all the gold and glory with them. Do you think you’re good enough to walk away with the pot, or will you be walking back to your bank with your pride and inventory in tatters? This Duel Arena guide will provide you with all the knowledge you need to understand all the aspects of duelling and maximize your chance to win your matches, and thus, your opponent’s money. The vast majority of duels in OSRS consist of “non-variable fights,” meaning as many variables as possible are eliminated. This includes armor, prayer, food, potions, and even movement. The general idea is that these variables do nothing but prolong a fight and are equally detrimental to each player. Two players with a full inventory of sharks will simply use up all their sharks, at a great cost to each player per duel. The same result is achieved if both players use no food. This logic is applied to each variable previously mentioned, resulting in most fights having those variables disabled. The only real exception is armor, as armor provides depth to some fights with different set bonuses, effects, and even counter plays. If armor is used, then I will likely be one of the following sets. The biggest variable in duels will always be the weapons used and how they are used, whether they are going for max hits, consistent damage, or trying to “rush” you with complex special combos. The following section will highlight the most-used weapons in the duel arena, their playstyle and their bonuses. 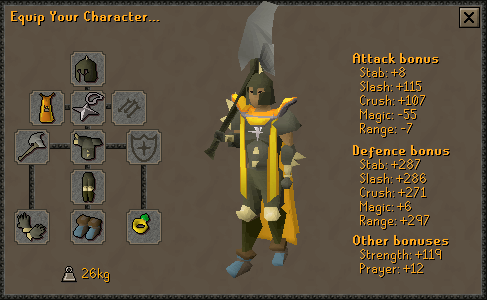 The Dragon Dagger (super poisoned) or DDS has long been the PKer’s tool of choice, providing the highest constant burst damage. At a fully charged special bar, you can get 4 specs out of it in quick succession. That’s four separate double attacks, and with a relatively high attack and strength level in the 70s and 80s, you could see two 20s from each of the special attacks. That’s the potential to hit nearly half of a player’s health bar, even with 99 health. The likelihood of this happening however, is very slim, but the possibility for that clutch play is there. Generally the idea of the DDS spec is to burst down a low health player, usually at 1/4 to 1/3 health, finishing them off with two midrange hits in one attack. Non-armor staking is slightly different as the DDS is the ideal weapon of which to burn your special bar at the start of a fight. A full 4-spec gives you the opportunity to hit 8 20+ attacks with the potential to hit several times your opponent’s health bar. This gives you a wide margin to fully “spec” a target from 99-0. 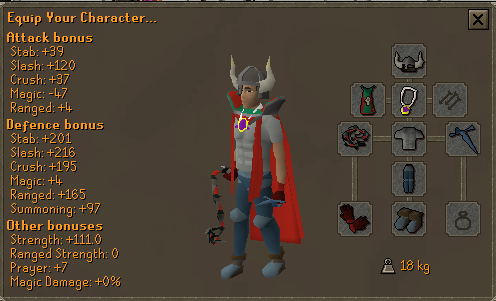 The G maul is another PKer favourite, having the ability to unleash 2-3 attacks in an instant with 50% of the special bar. Favored due to its relatively high strength bonus for a mid-tier weapon and the “execution” potential of low health players. There are far better weapons for consistent damage though, which is why this weapon is only seen towards the end of fights. The Armadyll Godsword (AGS) is a highly favoured PK weapon for its ability to execute and extremely powerful attack with its special, making full use of the AGS’ high single-attack damage due to being a top-tier two handed weapon with immense strength bonuses. This weapon has the ability to hit in the high 70s per special attack. Hits that high require you to be fully potted, have full prayer and to be extremely lucky. The Abyssal Whip is one of the PKer’s favourite weapons, utilizing its relatively high strength bonuses but more importantly, its high accuracy. The whip is a favoured weapon when you need consistent mid to high damage, amplified by the high attack speed it provides. Boxing is a highly popular duelling method which brings the duel down to almost sheer luck, depending on comparative player stats. Every staking restriction is checked off and you both enter the match punching and kicking each other to death. This is very popular since it eliminates most variables in the duels and is relatively simple to pull off. Generally players will go for the “strength” attack with the kick to try and do the highest damage possible. When players reach low health, some like to switch to the “accurate” option to get in those small—but needed—hits. As a note, if you come across any moments when you notice your opponent is preparing to attempt to burst you, be it with an AGS, DDS or Dharocks’s set, make sure to pop “Vengeance,” a lunar spell that will reflect 75% of the enemy’s next attack. There are usually four attack stances in this game, depending on what weapon you are using. While each weapon offers slightly different versions of these, they are mostly consistent. There will be an “accurate” attack stance which provides you with relatively low damage attacks that have a much higher chance to hit your opponent rather than miss. The “strength” attack generally misses a lot of attacks, but when it does hit, usually hits high. This is the stance where you’ll be hitting most of your max hits. The “defensive” stance is exactly how it sounds, providing you with an improved chance of reducing enemy damage, but suffering a vastly decreased damage output in both hit potential and accuracy. This stance is highly avoided in PK as the damage reduction outweighs the defence boost. There is usually one “other” stance which is generally “piercing.” This is a balance of the other stances, but is mainly used as the differentiator between crushing and stabbing attacks which are effective against chainmail and platebody respectively. More experienced Pkers are known to switch between stances as they dish out an attack and receive an attack. As their character begins their attack animation, they will select the “strength” stance to maximize their potential damage. When they are about to be hit, but are themselves not attacking, they will switch to defensive, in order to apply the damage reducing passive. This can get extremely complicated while micromanaging all the other intricacies in a duel, so only the most skilled PKers can pull this off successfully. In the duel arena, it’s survival of the fittest, through and through. Those that lose, lose their money (assuming you are staking something) and thus, their ability to stake. When picking duel opponents you first want to look for people that are at most 3 levels above or below you. This is your “band” where the fights are relatively even and an equal stake can be made. Next you want to look for those that are in your staking budget. As talked about before, you want to be staking at most 10% of your bank on the average duel. Avoid people using chat-bots as it’s likely these are either very experienced duellists that spend so long in the duel arena, they use bots to maximize their earning potential. What you are looking for is the relatively average player or what I call a “whale”—players that have more money than sense. Considered low stakes with most players in this band staking around 100k-500k. A general stake with sufficient value to entice a wide range of players. The high-stake band. These players either have large banks over 100m or are professional stakers, dealing hard and fast, making and losing bank on a daily basis. People in this band generally know what they are doing, so only stake this amount when you are confident of your duelling abilities. The band for extremely high stakes. Banks are being bet in this tier as an “all or nothing” gambit. There are few players in this band with the ability to sustain more than a couple of these duels. The band reserved for the ultra-rich. Most players in this band will not be betting their bank and will simply be the ultra-rich playing with their money. These are the sorts of duels that end up on YouTube as they don’t come around often. Sometimes bets are not equal and unbalanced staking occurs when two players have a considerable level or item disadvantage, or occasionally when one player is very well known for being a good duellist. Unbalanced stakes may also be offered by confident duellists to a player they have beaten many times before, as an attempt to entice the less-skilled player to part with more value. 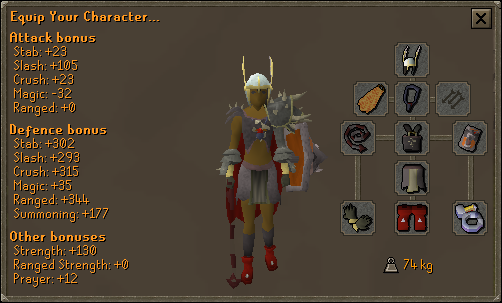 A player’s Player Identification Number (PID) refers to the priority the server gives you upon logging into Runescape. It’s a very misunderstood mechanic in the game, but one every player who is serious about PKing needs to know about in detail. PID is essentially the order the player’s actions on the server are registered. If you have a low PID, your actions will be first in the line and processed fastest. If you have a high PID, your actions will take place after everybody else’s. The importance in duels is the player with the lower PID will pretty much always get the first hit in a fight if both players simultaneously attack each other. In close fights, whoever gets the first attack can mean life or death as I’ve personally seen countless duels where both players are on single digit health and the one with the lower PID won the duel because his attack registered before the other player’s. Speaking from own experience as a Runescape veteran from 2001, there are some instincts that you can pick up which are incidental knowledge gained through thousands of duels. The first is that there’s always somebody better than you. You may be Zezima and have everything maxed (including your bank) but chances are, there’s a duellist out there who is just plain better than you. There are always subtle little tricks being picked up in the duel arena and not all of them are made common knowledge. Know when to give up. By this I don’t mean to stop staking, but to stop staking your regular amount or go take a break. If you are on a large losing streak you will feel pressured to “earn” it back. This is a classic gambling quirk and all it does is drive you deeper into the loss. If you lose your set amount for the day, go have a break, maybe earn some money and come back with smaller bets. Judge how your day is going and stake accordingly. If you seem to be doing nothing but losing today, yet you were constantly winning yesterday, there’s a good chance it’s just not your day. Do something else for that day then come back again tomorrow and test if your luck has improved.